In August, after months of indecision the weather in Southern BC mellowed into the sublime. Needing somewhere new to dip our paddles we turned to the West and there, lying in the shadows of the Selkirks and Purcells was Duncan Lake. Now Duncan Lake is not a real lake being created by the damming of the Duncan River back in the good old days when men were men and rivers were for sale under the Columbia River Treaty. 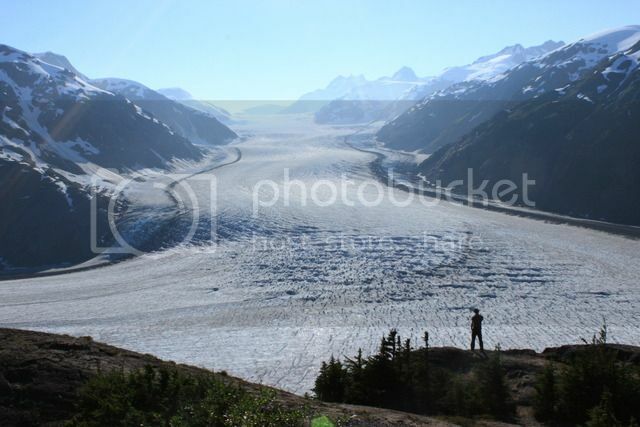 But still, a body of water hemmed by mountains and fed by glaciers so fair enough thought we. The information we were able to glean suggested good scenery, sparse camping and cougars behaving badly. Intrigued, we loaded up the duffel and motored West over the eroding hills to the flesh-pot of Nelson where we purchased a map and met with no luck obtaining any more info. 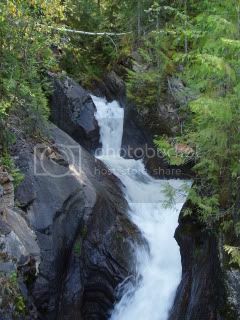 Nelson is a picturesque and lovely little town perched on a hillside above Kootenay Lake. Very nice if you like that sort of thing. 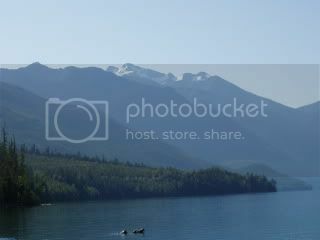 We headed North up the lake and the crowds receded and the scenery improved and after stopping in Kaslo for sustenance and beer we soon found ourselves on the North Arm of Duncan Lake at a causeway connecting the East shore to what was once an island and time before that a hill in a valley where a river ran. 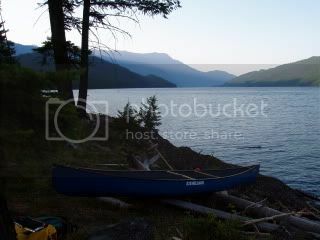 It looked good and we wasted no time in loading the boat and paddling off up the arm to the main lake. We passed an island with obvious camping but as it was only mid-afternoon and being full of ourselves we declined stopping in favour of further exploration. We paddled on up the lake noteing the passing of the hours and the absence of any stopping places. We crossed the lake and found a miserable sloping spot in the rocks and rejected it after some discussion and crossed the lake again and came at last to a creek and there hidden in the hemlock and cedar was a small site with just enough room for two and fine view up the festering pond North to the glaciers beyond. Morning brought more of the same fine weather and a millpond sea for us to enjoy. We paddled along past happy RVers and their legions of wheeled conveyances stopping at Dun Creek to search for an old prospectors trail that was shown on our map and rumoured to provide access to the alpine and glaciers above. A short hike up the road led us to discover a well built trail moldering in the forest. We followed it to a creek crossing and satisfied that it would lead to the promised land we returned to the boat and headed up to Cockle Cr. 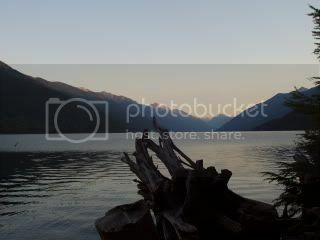 where we found good camping and excellent swimming where a log boom stretched across the lake. The flies and mosquitoes welcomed us with heartfelt joy. Morning found us stepping along the logging road to the Dun Cr. trail. There were several pack rats lying squashed in the dust of the road and if there was any portent or sign in this for us we were ignorant of it. At the creek crossing the trail suddenly disappeared. We searched high and low and followed a string of flagging that led up and on to nowhere and came back to the crossing where searching diligently we found the remains of a trail hidden in the forest. It climbed steeply up a ridge hard by the raging creek and the terrain grew worse and the sideslopes collapsed into the creek and the devils club nodded and swayed in the morning air beckoning us to come hither. We stopped to discuss the situation and in some disappointment decided that Dunn Cr. was not going to give us access after all. 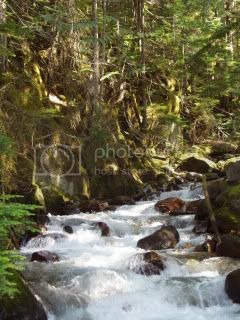 In no time we were down and back across the creek .The logging road was bakeing in the sun and the mosquitoes so enthusiastic at camp that we immediately packed up and headed south for the island we had seen on our first day. It was a long paddle but the site was a fine one. The exertions of the day proved too much for me and I experienced the sensation of falling asleep while swimming. 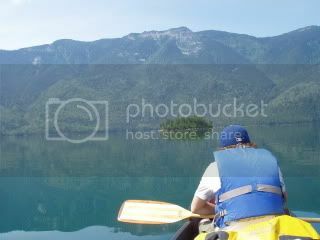 In the morning a short paddle was all that remained and we were soon at the truck where we loaded with practiced ease and headed South once more back to the real world and all its tender mercies. Camping is somewhat sparse but good where you find it. Swimming was good and warm which is somewhat strange as the pond is glacier fed. Lots of debris keeps power boaters at bay but no trouble for paddlers. The ubiquitous Bud can which is the most common cultural artifact in the East Kootenay is replaced in the West by Zig-zag rolling papers. This perhaps indicates that though the inhabitants may live at a relatively lower elevation they are not prevented from getting higher. I suspect that the volume of glacier meltwater is diminishing rapidly for your ponds. Not much left in southern BC/AB. We found this one in NW BC just outside Hyder AK. We thoroughly enjoyed BC and the Stewart Cassier Hwy, but Kamloops..just too hot. We did not have a canoe then. So thanks for the TR..
Lamenting the loss of experiences like this. Unusual to find "warm" swimming in the mountains although we did find Murtle Lake was OK. I experienced the sensation of falling asleep while swimming. Kids dont try this at home! Thanks for the trip report! so good to get any info on the lakes and rivers in the Kootenays. When we were there I was surprised to see so few canoes and even fewer outfitters. 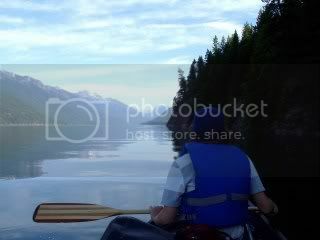 And the canoes at Lake Louise?...dont get me started....there ought to be a law against that old junk. We passed...actually we fled the lake in horror with the crowds. Most of the canoes were out. Lake Louise is pretty small and it looked like it had ants all over it.